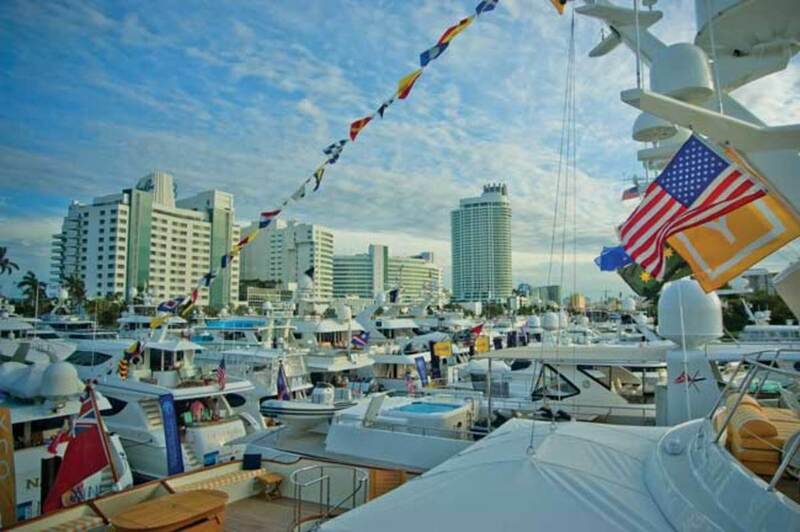 Boat show week in Miami encompasses multiple venues, but Yachts Miami Beach is the place to be. Boat show week in Miami encompasses multiple venues, but the really big boats are at Yachts Miami Beach and Superyacht Miami. For five days every February, the biggest names in the yacht industry, from world-class yachtbuilders and elite designers to the most respected yacht brokers and captains, converge on the destination city of Miami Beach. What attracts such power players? The city’s sizzle. And if you’re anyone who’s anyone in the yachting biz, you can’t afford to not be there. Miami Beach’s premier in-water luxury yacht show is February 16-20, with its main venue along Collins Avenue across from the Fontainebleau and Eden Roc hotels. 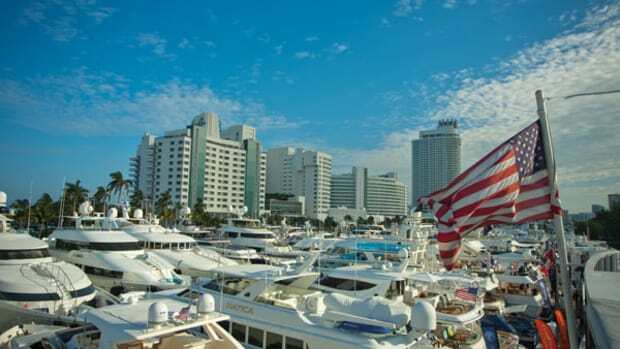 Yachts Miami Beach attracts thousands of yacht enthusiasts from around the world, with more than 500 new and brokerage yachts on display, along with an array of the latest marine technology and accessories. Together, the on-site merchandise is valued at more than $1 billion. The show also has a Superyacht Miami location at Island Gardens Deep Harbour on Watson Island, for deep-draft vessels up to 500 feet in length. The 29th annual Yachts Miami Beach will have a new look and layout for 2017. 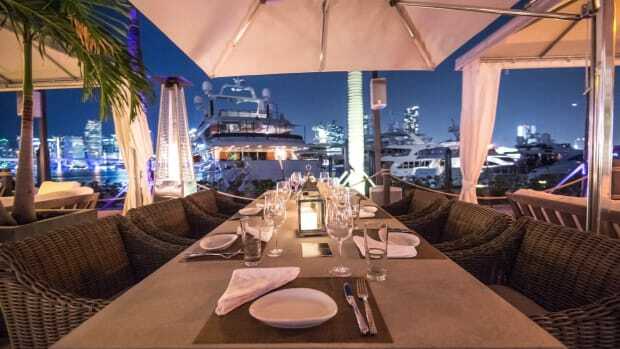 Show Management and the International Yacht Brokers Association, which co-own the show, engaged the design firm EDSA to reimagine Yachts Miami Beach. EDSA’s previous work includes Atlantis in the Bahamas, the John F. Kennedy Center and Disney’s signature resorts. “EDSA has translated our vision for engagement between exhibitors and buyers into a new, strategic and aesthetically pleasing design for Yachts Miami Beach,” Show Management Senior Vice President and COO Dane Graziano said in a statement. Spanning more than a mile along Collins Avenue from 41st Street to 54th Street, the show’s new layout is designed to highlight its waterfront location along Indian Creek Waterway. Attendees will enter through five new show entrances, each with wayfinding graphics and an information booth. Entry is $20 per person, per day. Foot traffic has been redirected from the sidewalk along Collins Avenue to the show’s network of new floating docks, where attendees will find food and beverage concessions. Yachts will be arranged in new-build and brokerage sections. Also for the first time, showgoers can arrive aboard free water taxis from parking locations. From the north, water taxi service embarks from the Miami Beach Rowing Club on 65th Street. Convenient parking is available at the 67th Street parking garage. From the south, guests can park at the 17th Street Miami Beach Convention Center parking garage and hop a quick shuttle to the water taxi at 24th Street and Collins Avenue at the Traymore Hotel dock. Bus shuttle service will be available from the 17th Street Miami Beach Convention Center parking garage to Yachts Miami Beach and the Miami International Boat Show. Valet parking is available at 43rd Street and Collins Avenue, closer to the valet garage than it was in the past, and taxis and Uber services are located at 46th Street and Collins Avenue. Shuttle bus service runs all day between Yachts Miami Beach and the Miami International Boat Show. 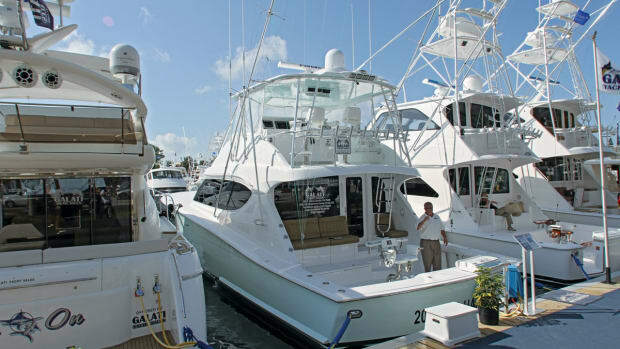 Two different boat shows take place in Miami and Miami Beach during Presidents’ Day weekend. Yachts Miami Beach is managed, produced and co-owned by Show Management and co-owned and sponsored by the International Yacht Brokers Association, Gosling&apos;s, Smallwood&apos;s Yachtwear, VolunteerCleanup.org and Yachtworld. It is separate from the Miami International Boat Show on Virginia Key. Strolling along Collins Avenue on a sunny Feb­ruary day, it’s hard to remember a time when the in-water yacht show now known as Yachts Miami Beach did not line more than a mile of Indian Creek, with more than 500 of the most spectacular vessels on display during the annual boat show weekend. Now in its 29th year, Yachts Miami Beach has grown dramatically, in both the number and size of vessels, into one of the yachting community’s most popular annual exhibitions, attracting an international audience to one of the most popular destinations in the world. The story of the show’s inception can best be summarized as, “Necessity is the mother of invention.” Almost three decades ago, with brokerage yachts prohibited from the Miami International Boat Show, yacht brokers needed a show where they could exhibit previously owned yachts. No one was more qualified than the producers of the Fort Lauderdale International Boat Show to make it happen. The first show featured 28 brokerage boats at Sunset Harbor, years before the area was developed with luxury condos and a marina. Show Management constructed exhibition space on what was essentially a dirt field. The following year, managers of the Eden Roc marina came to visit Dane Graziano, co-executive vice president and COO of Show Management, and suggested that the show move to Collins Avenue. It turned out to be a good idea. Forty-one boats signed up for the first show in the new location. “We moved from Sunset to Collins with a key group of brokers, persuading them to join us and become part of one big brokerage show,” said Graziano. For the first couple of years, the Brokerage Yacht Show, as it was known in the beginning, remained overshadowed by the Miami International Boat Show, but that changed dramatically as the exhibitor list grew to include renowned brands and brokerages such as Azimut, Burger, Fairline, Ferretti, Hatteras, Lazzara, Monte Carlo and many others of comparable importance. Attracting an increasingly international audience to its prime in-water location facing the legendary Fontainebleau and Eden Roc hotels, the show began to earn an identity of its own. By its fourth year, the Show Management team knew a bigger footprint was needed in order to meet growing demand for exhibit space. Forging a partnership with the then-Florida Yacht Brokers Association (FYBA) was key to securing the permits and earning the city’s trust. 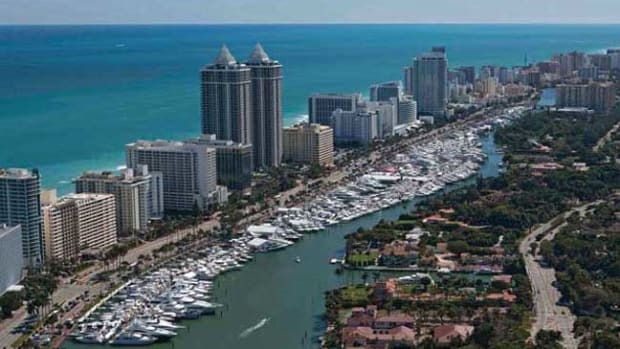 “The City of Miami Beach wanted to run us out of town until we established co-ownership with FYBA (now the International Yacht Brokers Association—IYBA), which is a nonprofit organization representing brokers of previously owned boats,” said Show Management Co-Executive Vice President and COO Andrew Doole. “Over time, we built trusting relationships with the city.” Yachts Miami Beach has been co-owned by Show Management and IYBA since 1989. There is no question that boats and boat shows are good for the local economy. “On behalf of IYBA and the thousands of people who park cars, wait tables, wash boats, clean boat bottoms, tune engines and do countless other jobs related to the show, I’d like to thank the City of Miami Beach for its good civic policies and continued support of this boat show, now 28 years old and going strong,” said Jason Dunbar, secretary of the IYBA board of directors. Brokers and new boat manufacturers appreciate the convenience of inviting clients from around the world and not having to bother with tickets. 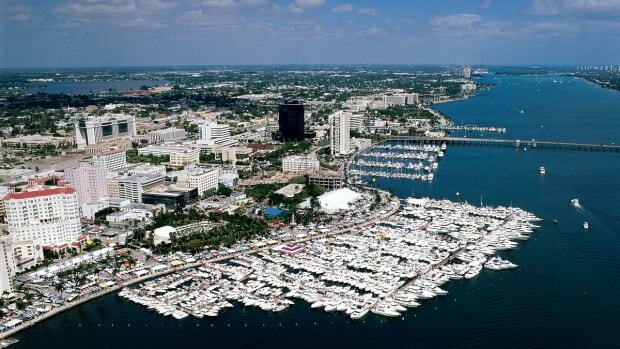 Yachts Miami Beach continues to attract new brands and the finest yacht brokers from America and around the world. With the panache and international allure of Miami Beach, it draws a strikingly international audience of high net worth individuals who love spending time here. With the addition of Island Gardens Deep Harbour Marina on Watson Island, Yachts Miami Beach now has a location featuring a limited selection of superyachts. 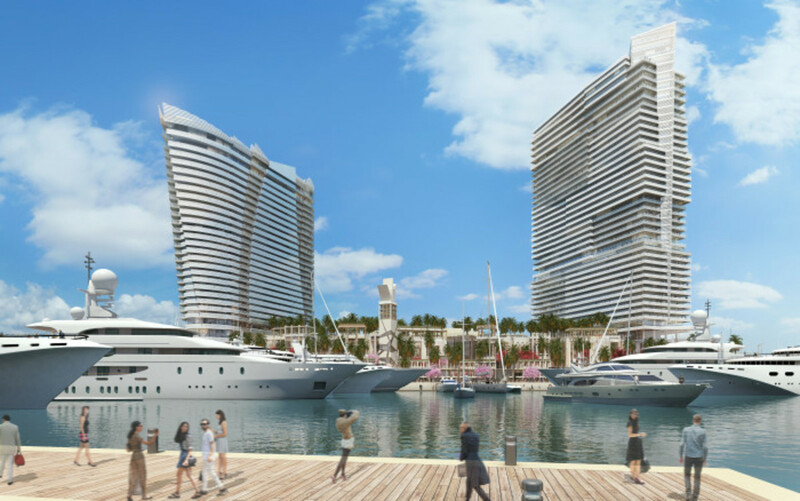 Once completed, the new marina will be able to accommodate 35 to 75 yachts from 80 to 500 feet, the largest collection of slips for yachts of this size in South Florida and North America’s only marina exclusively designed for superyachts. 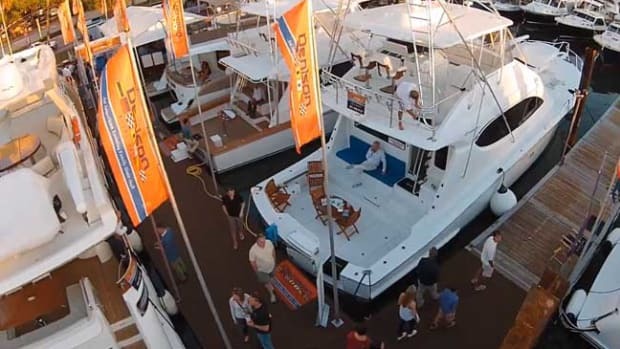 Last year, the show also announced a new name, highlighting its unique identity among major boat shows. 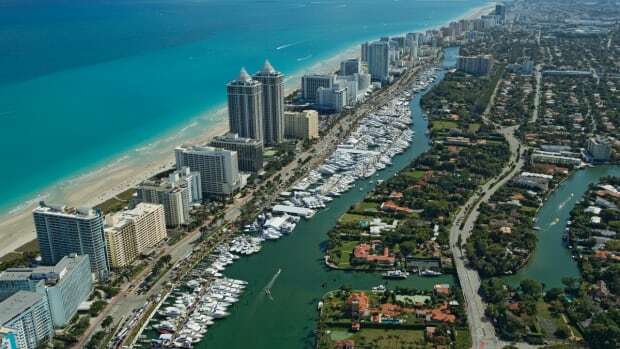 Yachts Miami Beach emphasizes the show’s location, its focus on large yachts in the water and its sophisticated, international appeal. “I’ve witnessed this Miami Beach brokerage show grow year after year, and 29 years later, the show and the City of Miami Beach have become internationally known as the pinnacle of style,” said IYBA’s Dunbar. With an eye on the future, show organizers work in cooperation with the city to produce a show that is an asset to the community. Environmental initiatives include the Pine Tree Park Clean-up, supporting the Waterway Clean-Up and achieving the goal of leaving Indian Creek cleaner than it was before the show. Here&apos;s where to find great food along Collins Avenue and at the Island Gardens Deep Harbour marina on Watson Island. The sizzle of this popular boat show destination goes far beyond the hot commodities you see on the docks. The sun slips behind the yachts on the show docks and the elegant homes across Indian Creek. As Yachts Miami Beach begins to shut down for the night, the evening stretches out before you. What to do now? Relax. You’re in Miami Beach, one of the foremost dining, dancing and all-around party capitals of the world. The newest noteworthy restaurant to open in town is right across Collins Avenue from the show in the iconic art deco-influenced Eden Roc Resort. Nobu Miami Beach (4525 Collins Ave.) is the latest work of Chef Nobuyuki Matsuhisa, who has established Asian-fusion restaurants bearing his name around the globe. In addition to opening the new Nobu (formerly located at the Shore Club) at the Eden Roc last fall, the chef, along with actor Robert De Niro and film producer Meir Teper, are headlining a multimillion-dollar renovation of the Eden Roc, which will relaunch as Nobu Hotel at Eden Roc Miami Beach this spring. 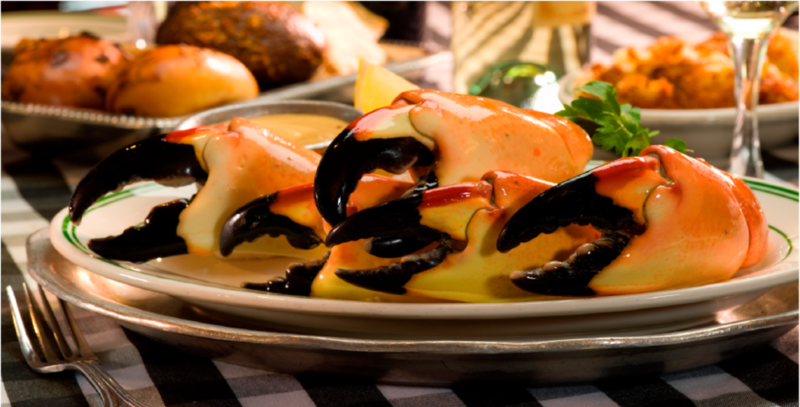 One of Miami Beach’s oldest restaurants, Joe’s Stone Crab (11 Washington Ave.), remains one of its most famous and is worth considering. The legendary eatery first earned its reputation more than a century ago serving stone crab claws in season with hash browns and coleslaw, and it has stayed with that winning combination ever since (a full menu is also available). The only caveat: Joe’s fame can result in a long wait for a table. If you prefer to eat your stone crabs in a more casual setting, try Monty’s Sunset in Miami Beach Marina (300 Alton Road). This open-air, tiki-style bar and restaurant lets you ogle the hundreds of boats berthed in the busy marina while savoring succulent crabmeat. 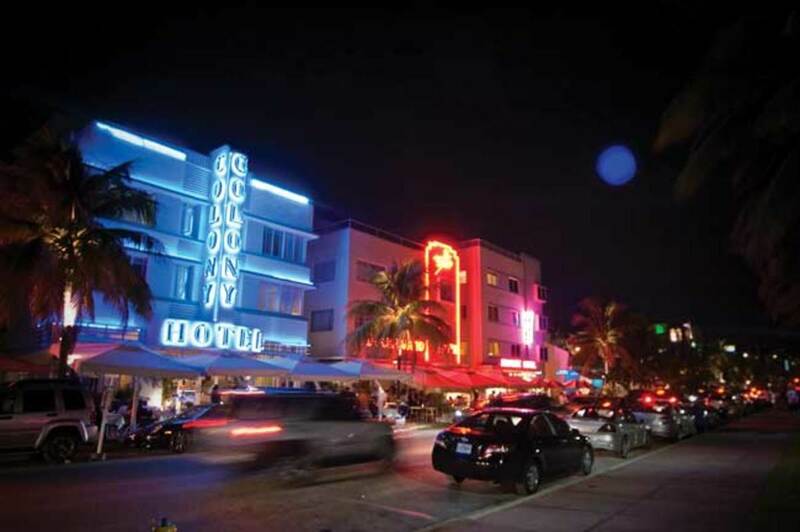 No visit to Miami Beach is complete without a stroll along Ocean Drive on South Beach. (You’ll want to walk, not drive, since traffic moves at around the same pace as pedestrians.) The beach borders one side of Ocean Drive, and the other side is lined with pastel-painted art deco buildings, boutique hotels, wine bars, swank restaurants and sunny sidewalk cafes. 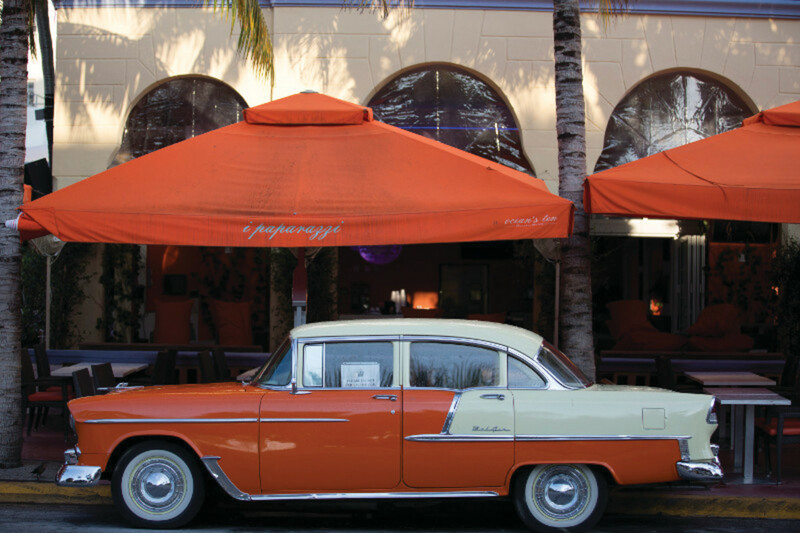 Another gastronomic hotspot in Miami Beach is Lincoln Road Mall. The trendy outdoor promenade runs from Washington Avenue to Alton Road between 16th and 17th streets. For pedestrians only, the strip is lined with chic shops and eye-catching eateries serving up food from all over the world. Most expand beyond their doors to oases of umbrella-shaded tables in the middle of the street. After surveying the boutiques, it’s time to choose your cuisine du jour. Miami is famous for its Cuban fare, so if that’s your choice, check out Yuca (short for Young Urban Cuban American), located mid-mall (501 Lincoln Road). Its “nuevo Latino” menu and contemporary décor both combine colors and textures. 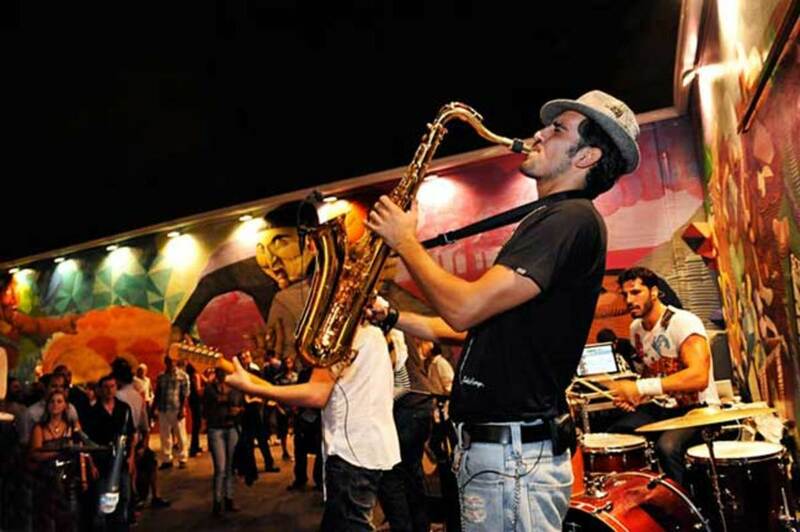 On Wednesday and Friday evenings, Yuca also hosts live salsa music and dancing in its Cuban Corner lounge. 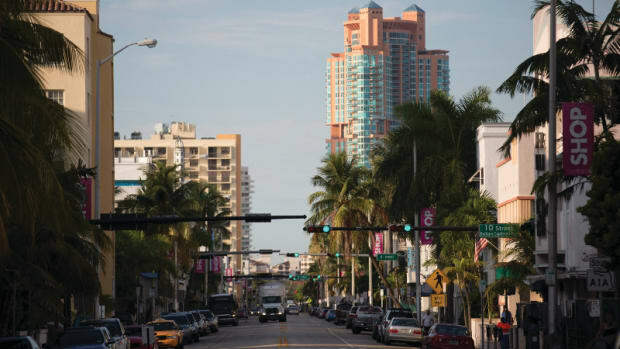 Miami Beach is one place where you’ll never hear someone say: “Let’s not eat at the hotel.” Collins Avenue is lined with historic beachfront hotels, many of which hail back to the days when Jackie Gleason and Frank Sinatra were regulars—both to entertain and to be entertained. (In fact, the Fontainebleau Miami Beach recently celebrated Ol’ Blue Eyes’ 100th birthday with a 100-day bash.) Most hotels here house an intimate bar and elegant restaurant or two—or three. Whether you’re dining or just delighting in the local libations, be sure to stop in at Delano South Beach (1685 Collins Ave.). 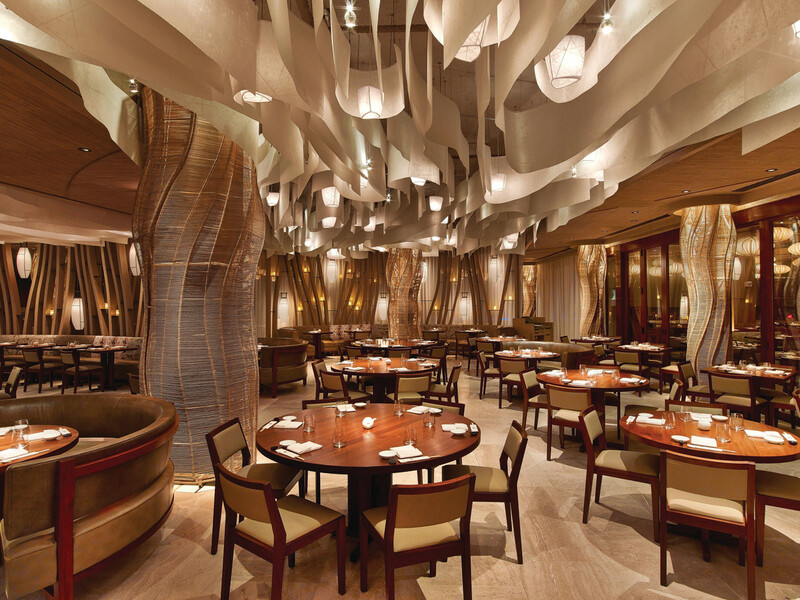 Designed by Phillipe Starck, its lobby is pure eye candy with billowing curtains and eclectic décor. The Delano is selfie central, especially the “big chair” in the front room. Check out the pool, too. Where else can you find a bistro-style table and chairs standing in the shallow end? Views of the river and downtown Miami with airy ambiance and elaborate seafood dishes — one of the hottest spots in the city.